Norbert Hofer is the presidential hopeful of the Freedom Party of Austria (FPÖ) in the forthcoming election (which is being re-run in December owing to previous electoral irregularities). The Freedom Party of Austria is considered ‘far-right’ because it advocates control of immigration (in particular of Muslims), which policy is considered ‘populist’ (and so crass), if not ‘racist’ (and so un-Christian). Herr Hofer used to be Roman Catholic, until his church denounced some of his ‘populist’ beliefs, such as his ‘Islamophobic’ or ‘nationalist’ immigration policy, criticism of which he reportedly described as a “left-wing Catholic witch-hunt”. Understandably, he got rather fed up with Catholic-socialist clericalism and is now a faithful Protestant, trusting in the grace of God for his salvation. We consider that mentioning God for one’s own political interests and using him along with reference to the Christian West to indirectly attack other religions and cultures amounts to an abuse of his name and of religion in general. We reject the use of God for political campaigning. If it had been a left-wing, pro-EU candidate, no doubt it would have been absolutely fine. But God doesn’t like ‘right-wing’ anything: He likes immigration and ‘Europe’ because it’s all about helping the weak and oppressed and being generous and neighbourly. He also likes peaceful and integration-ready Islam, of the sort Europe is witnessing in Molenbeek, La Courneuve, Malmö and Tower Hamlets. National security, jobs and social cohesion are of little concern: indeed, a Christian who prioritises these selfish obsessions above helping migrants/refugees/asylum-seekers is not being very Christian at all. Michael Prüller, spokesperson for the the archdiocese of Vienna, said over the weekend in a guest editorial in “Die Presse” that “God” is not a concept on which Catholics or Christians have a copyright. Also Prüller introduced the Second Commandment into the discussion. “It is not up to the church to speculate about Norbert Hofer’s motives, but if he brings God into the game, he does so at his own risk,” said the speaker of Cardinal Christoph Schönborn. The Second Commandment is concerned with God punishing those who take His name in vain, which is rather the point being made by the Protestants. It is interesting to note that Roman Catholic bishops have previously been “well disposed” to The Freedom Party’s emphasis on law and order, the family and solidarity; and Cardinal Schönborn refused to condemn the Auxiliary Bishop of Salzburg Andreas Laun, who has been effusive in his support for Hofer: “God help us and the people in our country!… You can only choose Mr. Hofer and pray for him and for Austria,” he told Kurier earlier this year. But what exactly is wrong with using the phrase ‘So help me God’ in an election poster? If God cannot be “manipulated” or “instrumentalised” for political purposes, why is He admissible in the Austrian presidential oath of office? Why did the Queen utter those very words as part of her Coronation Oath? Isn’t it an established part of legal-political liturgy throughout the monotheistic world? Isn’t it, actually, a sign of humility to acknowledge submission to a higher power? If one may talk about the heart and soul of a nation, why not God in that nation? Is it not an assertion of religious values and cultural traditions? And why is interceding for divine assistance so offensive to Protestants? Herr Hofer isn’t saying that his election victory is God’s will: he is imploring divine assistance in the pursuit of his political objective. What exactly is wrong with that? 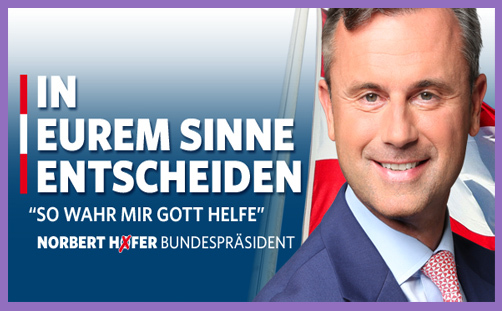 By objecting to The Freedom Party’s (ab)use of God for Norbert Hofer’s political ends, the Protestant churches of Austria are actually (ab)using Him for their own. They evidently deplore the FPÖ’s ‘far-right’ association; some 1,499,971 Austrians may deplore the church’s tacit support for Alexander Van der Bellen and the ‘far-left’ Greens. If a poster with the words ‘So help me God’ constitutes “an abuse of his name and religion in general”, as the Protestant churches state, how does any political appeal to religious values and Christian culture not also constitute an abuse? Is this not simply a manifestation of ‘political Christianity’? Norbert Hofer and his predecessor Jörg Haider may use religious slogans and symbols to convey their message, and these may attract neo-Nazi rabble-rousers and other undesirables, but there’s no doubt that many thousands of sincere Christians find succour in the style: they have fears, insecurities and deep concerns to which The Freedom Party offers persuasive answers in the vernacular. Norbert Hofer tweeted a series of ripostes to the Protestant leaders, reminding them that the Austrian national anthem mentions God; a picture of a US dollar note bears the slogan ‘In God we trust’; and a picture of the cover of a book about German Chancellor Angela Merkel, entitled ‘So wahr mir Gott helfe’, a phrase she also used when she was sworn into office. None of this is considered blasphemous by Protestants (even Austrian ones): the sacred fuses naturally with the profane in national politics, and has done since olive branches and wings of eagles were surrounded by glittering halos and constellations of stars. Anthems and dollar bills become expressions of faith not in kings, states or Mammon, but in their origins, traditions and the divinely-appointed institutions by which civilisation is ordered. A religion of politics is created every time a political entity offers a better refuge than the religious entity: the nation state, party or political leader are sacralised and venerated as the fount of salvation; political power is shrouded in holiness. Whether it is wise to invoke the name of God on a political poster is a matter of valid debate. But if the Lutheran and Reformed churches of Austria presume the authority to denounce Norbert Hofer for invoking God “for political ends”, may one ask who endowed the Lutheran and Reformed Christian leaders in Austria with the authority to invoke God in their Protestant cause? Who died and made Bishop Michael Buenker Pope?